Having been at the EAT! Vancouver festival for all three days, I was able to curate a lot of goodies from different vendors. Tonight’s dinner involves two ingredients that we purchased. We’d never tried squid ink pasta before so when we saw Tonnarelli Seppia Nera (an egg based squid ink medium noodle) at the Bosa Foods stall, we bought a pack ($4.99) to try. Then, at the Urban Fare stall, we saw fiddleheads! I got really excited as I’ve been wanting to try some for a while now. So we got a package of those also, and then I started planning the dinner menu in my head. Fiddleheads are really a young fern before they’re unfurled. They should not be consumed raw. The packaging indicates to boil or steam for 10 minutes before serving. 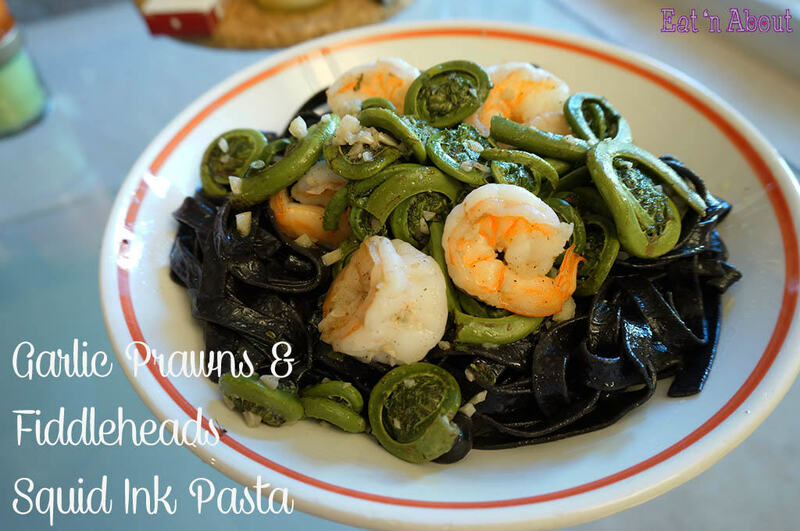 I figured squid ink pasta is best matched with seafood, so I decided to do an easy garlicky prawn squid ink pasta with these three main ingredients. Thaw and peel prawns. Set aside. Rinse fiddleheads thoroughly. Boil for 10 minutes. Drain. While pasta is cooking, mince the garlic. Heat a frying pan with 1 tbsp of oil. When pan is heated, add half the garlic. When its fragrant, add the fiddleheads and stir fry until coated. Season with salt and pepper. To the same pan, add prawns and cook until just pink. When pasta is cooked, drain in a strainer. To the pot that’s still hot, add remaining oil. Add pasta back to the pot and stir to coat with the olive oil. Then add the fiddleheads and prawns and mix through. 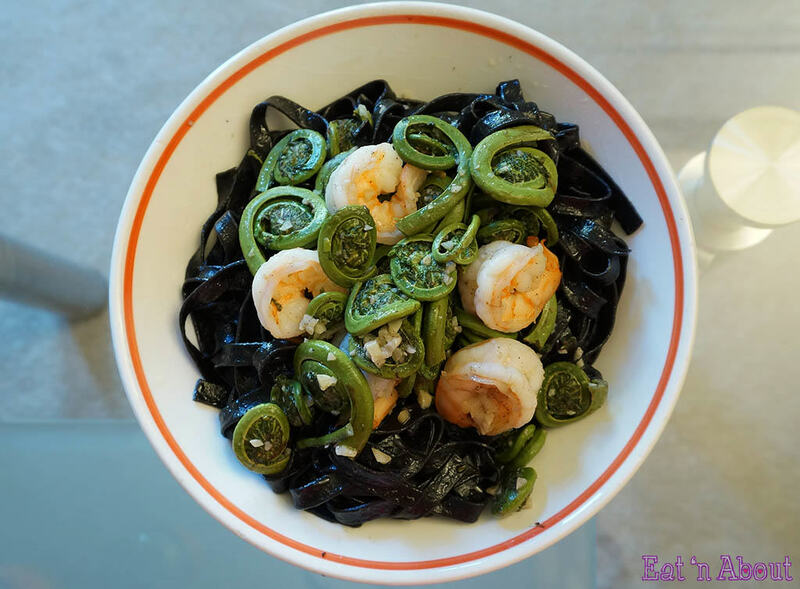 This is a simple olive oil based pasta dinner and looks pretty fancy to boot. I really like the texture of this tonnarelli from Bosa Foods. It’s got a nice chew to it. The fiddleheads were good too. There was still a slight crunch but there’s really not much flavor to them. So I think they’re revered for the texture and interesting (gourmet) look they bring to a dish. Also because they’re seasonally limited I suppose. Try it and tell me how you like this dish!